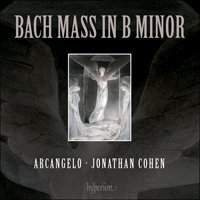 With major Bach vocal works now appearing on Hyperion, notably under Stephen Layton, the absence of an à la mode Mass in B minor had left an obvious gap for one of our most ‘completist’ of major record companies, not least because their last and only recording – Robert King’s 1996 recording with the wayward Tolzers – was only a qualified success and has not worn particularly well. Jonathan Cohen’s rejection of the generic, within a grand and ravishing overview, is what propels an overwhelming sense here that this reading deserves to be taken very seriously. Quite how in performance one ‘reads’ the span of a piece whose spiritual and intellectual symmetries are potentially so forbidding raises many issues but Cohen’s unforced feel for tactus, initially heard in the prima prattica (the more archaic) movements is revelatory in its coherence: witness the way the second ‘Kyrie’ arches with natural fluidity in a kind of liturgical knowingness. The same can be said, right at the close, in a ‘Dona nobis pacem’ which glows with a broad, valedictory affirmation that Karl Richter would have relished. If, over the years, one can identify accounts with particular ‘corporate’ identities – the strong instrumental balance in Frans Brüggen’s first version (Philips) or the homogeneous priorities of each of Herreweghe’s three readings – the most distinctive attribute here is how Cohen, with his exceptional choral and instrumental forces, resists pursuing a single overall textural ideal and instead seeks an evolving, unrushed relationship between each movement according to the musical stage in the journey. For example, the way the Gloria is deliberately ‘placed’ between an assuaging Kyrie and a ritualistic view of the Credo, as a public showpiece, allowing the large Mass groupings to find their own special personality and space without losing the grip, character or definition of each movement within. How solo movements work as ‘microclimates’ within each part of the Ordinary of the Mass, and especially within the totality of Bach’s set-piece choral frame, requires yet further directorial perceptiveness and the results here are rarely less than deeply compelling. If the first duet takes a while to settle, the Dresden-inspired ‘Laudamus te’ takes flight with radiance in the hands of the excellent Ida Falk Winland, and the geniality of the ‘Domine Deus’ sets up the ‘Qui tollis’ with an uncannily atmospheric gear shift. Arcangelo’s forces are not dissimilar to those of many leading mid-size ‘period’ ensembles and yet one of the over-riding attributes of this recording – in a church (Tetbury) which cannot quite deliver equal focus in all ensemble configurations – is how each musical invention is viewed as an exegesis to be graciously uncovered, often starting with chamber-like principles. Cohen often does so with a kind of continental galanterie and coloration, as in the ‘Patrem omnipotentem’, the concentrated luminosity of the ‘Crucifixus’ and ‘Confiteor’, and in Neal Davies’s ‘Et in Spiritum Sanctum’ and Samuel Boden’s ‘Benedictus’, both exhibiting a touchingly consorting sense of mutual belonging between voice and instrument. This is a performance where character and rich dimension emerge from within a patient and naturally projected vision of Bach’s most celebrated compendium. The work infrequently speaks with such gracefulness, freedom or conviction.